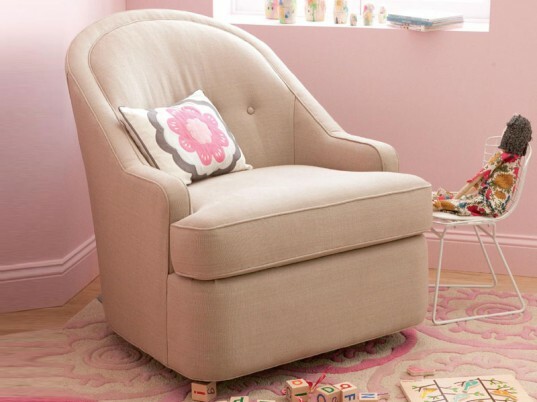 An eco-friendly glider or rocking chair is one of those must-have nursery items for many green parents. The right glider makes it easier to breastfeed and allows you to comfortably rock a fussy baby off to dreamland. The new DwellStudio gliders and ottomans are one option. While we’d like to see DwellStudio use sustainable fabrics for their gliders and ottomans (we’re thinking organic cotton or hemp) these new gliders and ottomans are a step in the right direction, featuring a wonderful sleek, yet cozy style and many eco-friendly features worth bragging about. The new DwellStudio gliders come in two flavors, the square minded Thompson Glider (shown at the top of this post) and the Savoy Glider which features a more rounded style (shown directly above). All of the hardwood used in DwellStudio gliders and ottomans is certified by the Sustainable Forestry Initiative (SFI) and any wood finishes used are lead-free, low VOC and completely non-toxic. DwellStudio uses single wrapped foam cushions with an eco-friendly foam core and poly batting. Gliders feature a recycled steel glide mechanism that allows for both gliding and swiveling. 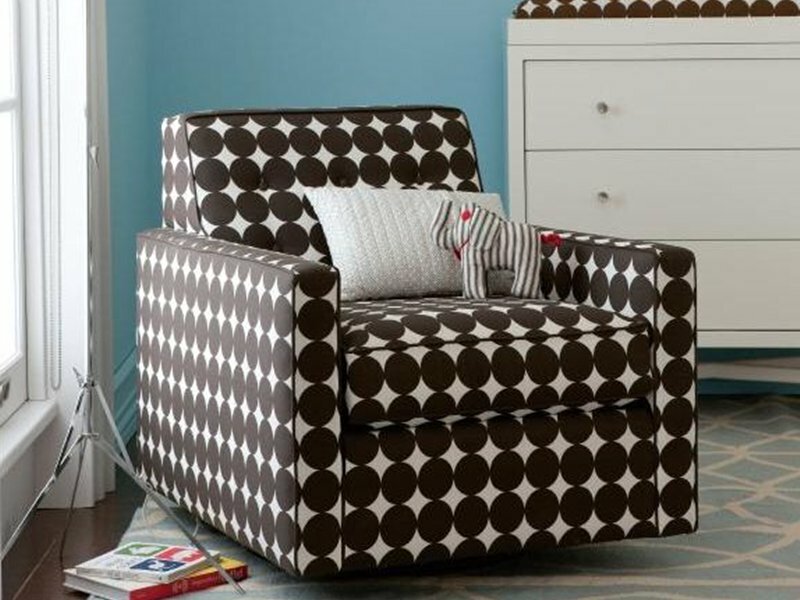 All upholstery is available in 100% cotton or linen and in a wide array of fabric designs and colors. Best of all these gliders will work well in a baby nursery, but later on, move seamlessly and stylishly into a living space, for a lifetime of use.